Learn from 16 professional West Coast Swing dance instructors, all on the same 2 hour DVD. 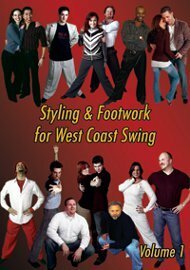 This DVD has 26 chapters covering footwork and styling for West Coast Swing, including body isolations, footwork from Carolina Shag, and more. Champion instructors include Chuck Brown, Jay Byam, Tessa Cunningham, Christo DeMaci, Jesse Dickson, Edwin Li, Rich Lundin, Jennifer Lyons, Jim Minty, Ben Morris, Myles Munroe, Melina Ramirez, Terry Roseborough, Libbat Shaham, Doug Silton, and Patty Vo.